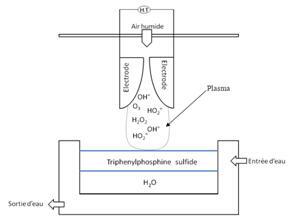 This study reports on the degradation of an organophosphorus compound, triphenylphosphine sulfide in an organic phase on top of a water phase by gliding arc discharge (Glidarc). Glidarc induces the formation of plasma containing strongly oxidizing species that are able to degrade organic compounds. The degradation of our pollutant induces the formation of PO43- ions which move to the water phase. Several parameters were investigated such as the volume of the organic phase and the initial concentration of the pollutant. Results show the efficiency of this technique to the degradation of the organophosphorus pollutant.